When it comes to the curb appeal of your business, parking lot maintenance is of the utmost importance. A well-maintained parking lot really can make the difference between a positive first impression and a negative one. Therefore, it’s essential to keep your business’s parking lot well-maintained and free of debris – especially in the summer when more people are out enjoying nice temperatures. By summer, the focus shifts from snow and ice control to landscaping, irrigation services, and parking lot repairs. High temperatures, droughts, foot traffic and parking lot wear are large concerns during the summer; therefore, it is especially important that your commercial property’s assets receive adequate attention to maintain their appeal through the year. Portering: From trash pick-up, cleaning of the areas, maintaining all of the trash containers, and more – More Clean does the dirty work for you, ensuring your property is in top shape and presentable to all tenants, visitors, and customers. Mowing and Edging: To ensure grass blades are even, we recommend mowing once a week during growing season. Seeding and Weeding: We offer services that will allow us to monitor the lawn to find new weeds and root them out before they have a chance to grow roots. Plants and Flowers: We choose plants that handle hot, dry conditions around parking lot areas so that commercial sites can keep the property looking healthy and vibrant even when it is super hot. Sweeping: More Clean of Texas provides reliable, state of the art sweeping services, giving our customers peace of mind. From sweeping roads and construction sites to shopping mall parking lots and warehouses, we understand each business and location is unique. 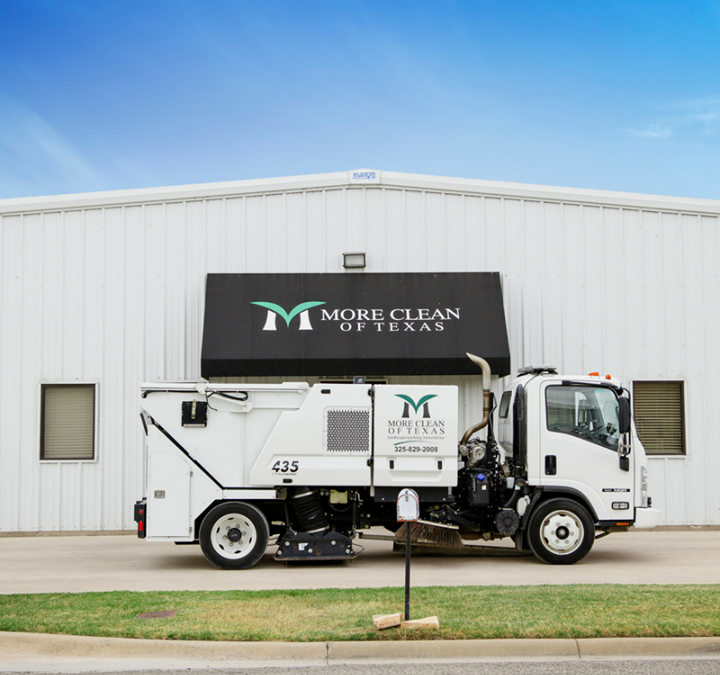 We can provide a customized, flexible sweeping schedule that takes into consideration your business hours, traffic and parking patterns, local noise restrictions, and debris levels. Striping: Parking lot appearance is key to maintaining your property and also for safety issues. In addition to regular parking lot maintenance, we can also perform line striping and painting on any type of surface. Power Washing: Prior to any striping job, our parking lot crews power wash the area and allow it to dry so that it will last much longer and lengthen the life of your investment. With our pressure washer, we can easily remove dirt, dust, grime, mold growth and the like from walls, fences, parking lots, driveways, sidewalks and even plants. Proper and Consistent Landscape, Parking lots, and Exterior Maintenance: Unlike seasons, quality of service doesn’t change. That is why we recommend scheduling regular upkeeps and maintenance routines to ensure that the property’s appearance and presentation is up to top standards every season, just like our very own at More Clean of Texas. With each of these elements considered in your seasonal master plan, we guarantee you are on your way to passing the customer approval test. If you’re ready to boost your business by having your parking lot and exterior appearance tidied up, then it’s time to get in touch with More Clean of Texas. Simply give us a call at (844) 655-1987.